Pre-heat the oven to 425˚F. 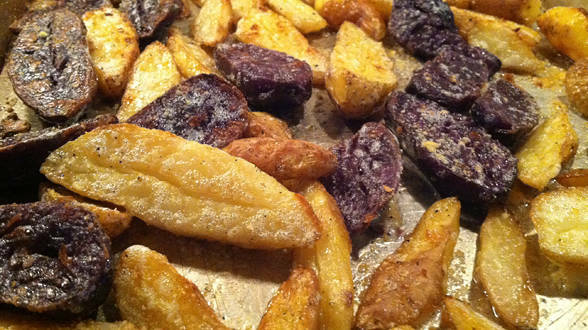 In a large pot, cover the fingerling potatoes with cold, salted water and bring up to a boil. Cook until just tender, about 8 minutes, then drain. While the potatoes cook, melt the butter in a small pot with the garlic and cook over medium-low heat for about 4-5 minutes. Pour the melted butter onto a baking sheet, then place the potatoes on top, cut-side down. Roast until deeply golden brown, about 20 minutes. Remove the potatoes from the oven and flip them over with a spatula. Season with some salt and sprinkle with the Parmigiano Reggiano cheese and lots of black pepper. Return the potatoes to the oven for 5 more minutes until the cheese is melted. In Recipes-list.com we have selected the most viewed recipes from category - uncategorized . Enjoy the best recipes specially selected for you! Alfredo Potato Finger Fries is the right choice that will satisfy all your claims.